Even though our group made it to #50 two weeks ago I will try to post on the ones I missed. Some because I joined them at number 16 and others because.....well, life got in the way! 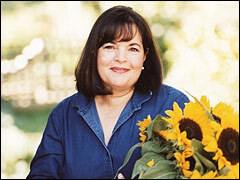 At number 39 of the 50 Women Game Changers in Food, is one of my personal favorites - Ina Garten. She was a former White House nuclear policy analyst, taught her self how to cook by working her way through Julia Child's "The Art of French Cooking" while living in Paris with her husband. She later owned a specialty food store in the Hamptons and then became a Food Network favorite with her own show The Barefoot Contessa, still very popular today. She has published at least 7 cookbooks with another to be published in October 2012. I have all her books and all her recipes are great. However, I had no problem deciding which one to choose for this post. Eli's Asian Salmon has been a longtime favorite in our home. I guarantee this one is a keeper. Line an 8 by 12-inch baking pan with aluminum foil. Place the salmon in the pan. In a mixing cup, combine the soy sauce, rice vinegar, lemon juice, oyster sauce, fish sauce, sesame oil, chili paste, scallions, garlic, and ginger. Pour 1/3 of soy sauce mixture over the salmon fillet. Sprinkle the panko evenly over the fillet. Pour the rest of the soy sauce mixture evenly over the panko. Be sure to soak the panko completely and if any runs off, spoon back onto the salmon. Set aside for 15 minutes, leaving all the sauce in the pan. Meanwhile, preheat the oven to 500 degrees F. Roast the salmon for 18 to 20 minutes, or for about 12 minutes per inch at the thickest part of the salmon. The internal temperature will be 120 degrees F on a meat thermometer when it's done. Remove from the oven, wrap tightly with aluminum foil, and allow to rest for 15 minutes. Serve hot or at room temperature.